Composer … bass player … cat trainer? 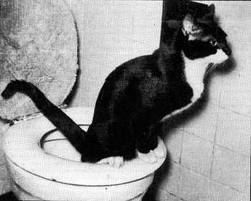 Charles Mingus (April 22, 1922 – January 5, 1979), a man of boundless energy and appetites, and the author of “Beneath the Underdog,” trained “Nightlife,” his cat (depicted above), to use the toilet, which raises the philosophical question … does a cat take a Reader’s Digest to the bathroom? You can find and follow the complete step-by-step instructions at: Charles Mingus Cat Toilet Training Program. Mingus’ final music project was a collaboration with singer/composer/guitarist Joni Mitchell. Despite suffering from amyotrophic lateral sclerosis, commonly known as Lou Gehrig’s disease, he composed three new tunes for the album. A fourth Mingus composition, the classic “Goodbye Pork Pie Hat”—an elegy to saxophonist Lester Young—is also included. Mitchell wrote all the lyrics, and dedicated the entire project to him. The album also includes several excerpts from tape recordings of Mingus speaking, including a brief argument about his age with his wife Sue Graham Mingus heard briefly in the beginning of “God Must Be a Boogie Man,” the track featured below. Written by Mitchell, and noted for the percussive electric bass accompaniment by Jaco Pastorius, it is the only tune on the album Mingus did not get to hear as it was completed two days after his death. It is a fitting requiem for the jazz giant. This entry was posted in Music and tagged Cat Toilet Training, Charles Mingus, God Must be a Boogie Man, Jaco Pastorius, Joni Mitchell by Ourstorian. Bookmark the permalink.